* excluding the schematic of the Raspberry Pi and the blob used by its Broadcom SoC to boot up. Still, it’s closer than a lot of the competition, so still a worthy project. Came here for this comment.I knew there was going to be an issue with following the words Open Source with Raspberry Pi, but when will HAD authors learn!? When the name is Zynthian, I expected it to run on the ZYNQ. I wonder if a port is possible. Of course! That makes sense. isn’t it strange, he uses an io expander to add 2 gpio, but the expander uses 2 gpio ? The expander adds 16 GPIO (MCP23017) and uses 2 GPIO as IRQs. I put together one of these without all the extra hardware. Just a Raspberry, a touch screen and a sound card. 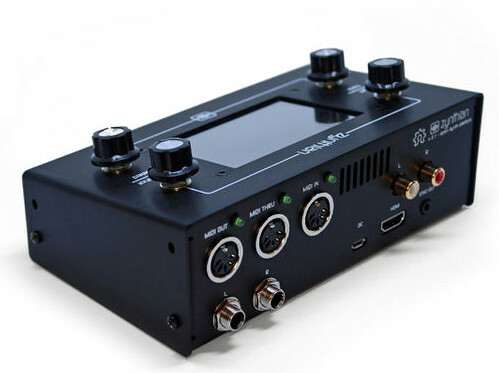 The UI supports just using a touch-screen – so you don’t need the rotary encoders. Download the image, flash an SDcard, stick it in the Raspberry and boot up. I plugged in a USB MIDI keyboard controller and voila, an amazingly capable synthesizer! Why not just run AMSynth software on the Pi?